In October/November 2012 I visited the Himalayas. I spent eleven days in Nepal and four days in Bhutan. The whole trip was organized by Himalaya Holiday Service. I was very happy with the tour itinerary and the tour organization. I flew from the USA to Bangkok, where I stayed for two nights. From Bangkok I flew to Kathmandu via Delhi. In Kathmandu my local guide and driver picked me up at the airport and brought me to the hotel. The next morning we drove for four hours to Chitwan National Park, where I stayed for two nights. After arrival we walked into the park. During this walk we saw three rhinos. On the next day in the morning we went on an elephant ride into the park. We saw several types of deer, but no rhinos or bears. The elephant grass is so high (6 - 8 m (20 - 26 ft)) that it is very difficult to see anything. We could have been 50 m (160 ft) from a bear and never seen him. In the afternoon we went on a canoe trip on a small river into the park, and continued to walk further into the park. Again, we saw rhinos while on foot. Our guides always kept a good distance from the rhinos, since they are very aggressive, and regularly kill people that get too close. The next morning a new driver brought me to Pokhara, a 5 hour drive, where a new guide picked me up. I stayed in Pokhara for three nights. In the afternoon after arrival I walked around Pokhara a bit. The next day we took a boat across the lake and hiked up to the World Peace Pagoda. It was about one hour to the pagoda. From there we hiked back down to Pokhara and visited the waterfall and the cave in Pokhara. Both are interesting to visit. They are both next to each other in Pokhara itself. After the second night we got an early morning start (4:30) in order to drive and then hike for 40 minutes to the summit of Sarangkot to watch the sunrise over the Annapurna Mountain Range, a part of the High Himalayas. The hike back down to Pokhara was almost three hours. The next morning I flew back to Kathmandu. Unfortunately, I was on the wrong side of the airplane, so I didn't get a view of the Annapurna mountain range from the airplane. In Kathmandu I was picked up by a local guide and driver. They brought me to Bhaktapur, where I stayed for one night. In the afternoon, my new guide, Paras Mani Amgain, picked me up and showed me the Durbar Square in Bhaktapur, with temples and palaces, as well as other sites in Bhaktapur. The Durbar Square is the site of the royal palace, together with many Hindu temples. There are three Durbar Squares in the Kathmandu valley, in Bhaktapur, in Patan, and in Kathmandu. These were the three places where the three kings of the Kathmandu valley resided. Paras stayed with me for the remainder of my time in Nepal. He was a great guide, very knowledgeable about the history and architecture of Nepal and about Hindu legends. It helped me a lot in collecting and putting online my pages about the Hindu mythology and Gods and Goddesses. After another brief visit to the Durbar Square in Bhaktapur the next morning, we drove towards Nagarkot. I hiked about two hours along the way. In Nagarkot I watched the sunset over the Himalaya range in the evening, and the sunrise the next morning. This was really spectacular. After the sunrise watch, we drove back toward Kathmandu. We visited Dhulikhel and Panauti, two interesting towns with old architecture. After that I visited the Chandeshwari Temple. For the next three nights I stayed in Kathmandu. After the first night there we visited Patan, Bungamati, and Khokhana. On the last full day we visited several interesting sites in Kathmandu, including Kathmandu Durbar Square, the Bagmati river with the cremation sites, and Boudhanath Stupa, one of the holiest Buddhist sites. After the last night in Kathmandu I continued on to Bhutan. On this flight I was seated on the side of the airplane with a great view of the Himalayas, including Mount Everest. Nepal reaches from the lowlands on the border to India all the way to the highest peaks in the Himalayas. The highest mountain on earth, Mount Everest, is located in Nepal. Seeing the High Himalayas is awesome. Nepal was divided in 51 small kingdoms. In the Kathmandu Valley there were three kings from the Malla Dynasty, with their seats in Patan, Bhaktapur, and Kathmandu. That is where the three most elaborate Durbar Squares (King's residences) are. The various small kingdoms were united in 1768 after the Gurkha king Prithvi Narayan Shah invaded Kathmandu. From 1768 on, Nepal was an absolute monarchy of the Shah Dynasty till 1846. In 1814, Nepal lost half its territory to the British. This is still a sore point, and there are many people who feel they should get their territory back. In 1846, the Rana dynasty gained power in Nepal. The Ranas became prime ministers and reduced the King of Nepal to a figurehead position. The Ranas ruled Nepal as hereditary prime ministers though in the name of the figurehead king till 1951. After that, the king took over again. In 1990, under King Birendra, Nepal became a constitutional monarchy. King Birendra believed in cooperation between absolute power of the monarchy and democratic governance. On 1 June 2001, a number of members of the Shah dynasty were murdered in the royal palace. This event is known as the Royal Massacre. A High Commission report concluded that the royal family was slaughtered by Crown Prince Dipendra, however this remains controversial. Among the dead were the Crown Prince's father, King Birendra and his brother, Prince Nirajan. After the attack, Dipendra was in a coma and was declared king for a short time. He died a few days later. Gyanendra Bir Bikram Shah, Dipendra's uncle, took the throne. In February 2005, he dismissed the parliament to govern in his own right. After a decade-long civil war with Maoists, in which some 15,000 people were killed, an agreement was reached in 2005 to hold elections for a constitutional assembly to develop a constitution. On 24 December 2007, the Nepalese Constituent Assembly met. It was decided by majority vote that the monarchy would be abolished in 2008 after the Constituent Assembly elections. On 28 May 2008, the Assembly declared Nepal a Federal Democratic Republic and the monarchy was abolished, removing the Shah dynasty from power. But so far, the Constituent Assembly has not been able to make a constitution. The Supreme Court dismissed the assembly in 2012 and ordered new elections. Currently, a caretaker government is in place. I didn't really get into contact with many local people during this trip. Most of the people that I met seemed friendly, but somewhat reserved. The few that I talked with more seemed to be very interested in what is going on in the world. It is easier to talk with people in Nepal that it usually is in Africa. In general I had a comfortable feeling in Nepal. People in Nepal are very religious, similar to what I saw in Bhutan later during the trip. You can frequently see people worshiping at a temple of shrine. But as opposed to Bhutan where the majority of people are Buddhists, 80% of the people in Nepal are Hindu and 10% Buddhist. People are quite similar to the people in the northern parts of India. They use the same script. As I understand it, they can understand each others languages somewhat. The clothing styles are also very similar. People in Nepal are much more industrious than people in sub-Saharan Africa. Everybody was working, you rarely see people just sitting doing nothing, something you see everywhere in Africa. Another difference from people in Africa was the fact that nobody objected to me taking pictures. Again, this was very different in many parts of Africa. One thing that was somewhat disturbing was the fact that everybody is spitting, everywhere, all the time. This used to be just as bad in China, but China is trying to get people to stop this, with some success. I was in Nepal during the time of a fifteen-day festival called Dashain. Because of that I saw quite a few people dressed up nicely, more so than you would normally see. The festival affected a lot of things, including traffic. One night I was kept awake for long periods of time by barking dogs. My guide said that this was because people moved around all night because of the festival, which kept the dogs barking. Sure enough, the next night was quiet, no barking dogs. One part of the festival tradition is to set up swings everywhere. Some of them were very tall constructions of bamboo poles. Traditionally, each Hindu families sacrifice a goat during the festival. Traffic uses left side driving, like in India. Kathmandu is a very busy city with significant traffic problems. The road conditions are frequently quite bad, with some roads unpaved, even in the city. The trucks cause a lot of pollution around Kathmandu. People tend to drive in the middle of the road, instead of on the left side. They even seem reluctant to relinquish the middle of the road for oncoming traffic. Honking is normal and done profusely. Food is mostly Indian food, which I like. One evening I had Nepalese food, which was quite disappointing. It was not very good, very small portions, little selection, and very expensive. In the hotels the food was mostly buffet style, usually with a good selection of different kinds of Indian food. The beer is regular German style lager, just what I like. It was quite inexpensive with $2.50 to $4.00 for a 0.6 liter (1.3 pints) bottle. In Pokhara, the beer on the first day was warm, they had lost power. Later, with the power back, the beer was cold. The hotels were all good, clean. Unfortunately, most of them did not have heating. Since it got a quite chilly at night, this was a bit of a problem. One problem that occurred everywhere in Nepal were frequent power outages. The power would go off and sometimes stay off for hours. That was sometimes problematic with respect to charging camera batteries. The temples and palaces were the highlight of the trip (in addition to the rhinos in Chitwan). They are fantastic to see. Seeing these alone was worth the trip. When I booked the trip I made sure to avoid the monsoon season from June through September. It worked, and I had great weather throughout the trip. Temperatures were around 20°C - 25°C (70°F - 77°F) during the day, and mild at night. I had no rain during the trip. Livestock is walking around everywhere, including in Kathmandu. Cows are sacred in Nepal, just like in India. What was really conspicuous were the dogs. There are extraordinary numbers of dogs in Nepal, even more than in Bhutan. They are everywhere. 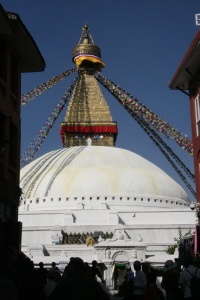 I liked Nepal, I felt very comfortable. Especially the many temples and palaces were a treat to visit. And the rhinos in Chitwan were great to see. The High Himalayas are impressive, even from a distance. And of course seeing Mount Everest during the flight from Nepal to Bhutan was a great experience.